New Zealand has reportedly asked a group of British tourists accused of littering and stealing to leave the country. The tourists, apparently a large family, have been causing trouble since December. They allegedly littered, stole items, dined and dashed, were mean to locals, and treated store and restaurant employees poorly. Fed up, the New Zealand government revoked their visas and gave them 28 days to leave the country, according to multiple reports. Apparently, they have complied and left the country. They came from the UK, and for more than a month, they've been terrorizing New Zealand. A group of between 10 to 15 British tourists has been asked to leave the country of New Zealand after being accused of littering, theft, dining and dashing, and generally running amok since arriving in December, according to multiple reports. The group, who is believed to be a family from Liverpool, England, told the New Zealand Herald that they were visiting the country "on holiday" - but it seems that their vacation is ending earlier than planned. The trouble started on December 7, according to the New Zealand magazine Stuff. The outlet reported that the family entered a Caltex convenience store in Auckland, New Zealand, where two children stole a Christmas tree. According to the outlet, two women also stole smaller items from the store, smuggling them in their clothing. "It was shocking," Ankur Patel, the store's manager told the magazine. "I could not believe they would just walk out with a Christmas tree, especially children." The family returned to the store twice - first on New Year's Eve and then on January 3 - where employees recognized the license plate on the car from security camera footage. During the January 3 visit, a man from the group paid for some of the stolen items, but not all of them, Stuff reported. On Wednesday, Tina Marie Cash, a member of the group who had a six-month travel visa, pleaded guilty to two counts of theft. According to the New Zealand Herald, she was ordered to pay R750 for the items, including sunglasses, wire rope, and four Red Bull drinks from the store. Cash, who had no criminal history, told police she did not remember stealing the items but did recognize herself on the security footage. The tourists have also been accused of causing trouble at several restaurants, according to the New Zealand Herald. The family has refused to pay for meals on at least four separate occasions, according to the outlet. The group of more than 10 travellers repeatedly allegedly ordered large meals, and after finishing them claimed to find bugs or hair in their food and drinks, and refused to pay, per the Herald. Roger Van Kempen, the manager of The Backyard Bar & Restaurant, where the tourists refused to pay for five meals worth nearly $60 each, and allegedly put ants into their own food, said the guests became aggressive when confronted about the situation. The group also allegedly dined and dashed at a restaurant on January 9, threatening staff before they left. While visiting Takapuna Beach, the group also did not pick up their trash, according to the New Zealand Herald. And when a woman attempted to ask them to clean discarded boxes, beer bottles, and baby wipes, they allegedly responded by threatening her with physical violence. "About four or five ladies stood around me ... in a half circle. They were saying they were going to hit me ... and I started walking backwards to get out of it," Krista Curnow told the outlet. "Even grandma and the child got involved, saying they wanted to punch my head in." "We approached the family to ask them if they can please not leave without picking up their rubbish, their response was basically if we have a problem then we can pick it up and that that's what the council is for," Cunrow wrote on Facebook. 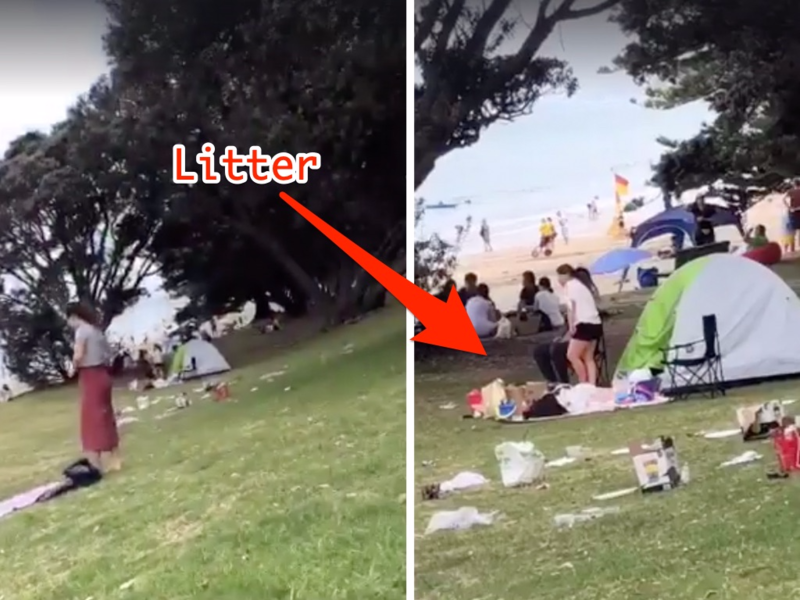 "Police will be speaking with those involved and will be referring them to [Auckland] Council with regard to their behavior around the littering of rubbish," Inspector Kevin McNaughton told the New Zealand Herald of the incident. "Police would like to remind the public that offenders caught illegally dumping rubbish may be issued with a fine of up to $400." The group was issued a deportation notice on Tuesday following an incident at a Burger King related to their "unruly behavior" at the restaurant. The family was given 28 days to leave the country, according to the New Zealand Herald. "I'm no one famous. I'm just a fat kid from England on holiday," a member of the group who identified himself as John Johnson told the Herald. He said he was looking forward to getting to "see the Hobbits," which will not happen now that they will leave the country earlier than planned. "We have to go home early because the New Zealand people are treating my family like s--t," Johnson said. "We paid a lot of money to come here for a family holiday." The family told the Herald they will leave by Friday, a week earlier than they originally planned.